Home Tags Posts tagged with "lenses"
U.S. company Innovega announced that its iOptik contact lenses which focus 3D screens directly into people’s eyeballs could be on sale as early as 2014. The tiny “screens” sit directly on users’ eyeballs and work with a pair of lightweight glasses with a built-in translucent screen. The experience is equivalent to a 240-inch television viewed at a distance of 10 feet, says Innovega’s CEO Steve Willey. The devices can “pair” with smartphones and portable game devices to deliver up-close video – or switch to a translucent “augmented reality” view, where computer information is layered over the world we know. 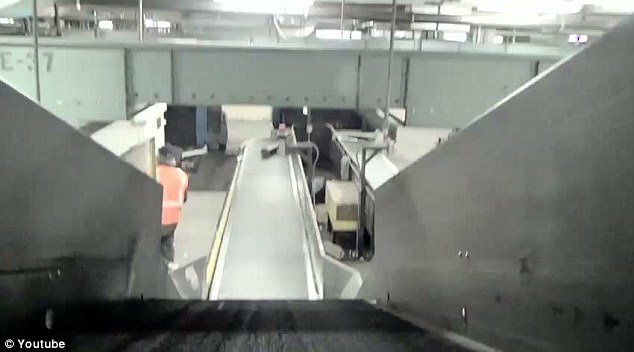 The devices can be worn while moving about – previous bulky “VR headsets” have blindfolded their users and can only be used sitting down. The effect could be similar to the lenses worn by Tom Cruise in Minority Report. Innovega is also developing hi-tech lenses for use by American soldiers, feeding battlefield information directly into their eyes. DARPA (the Defense Advanced Research Projects Agency), thought of as the American military’s “mad scientist” wing, has been funding research on “soldier mounted displays” for some time. It’s now working on “iOptik” lenses with Innovega. The lenses, made with nano-scale engineering processes, work as a hi-tech focusing device, which allows Innovega’s glasses to be considerably less bulky than previous devices. The lenses themselves require no power, and thus can sit safely on the eyeball. 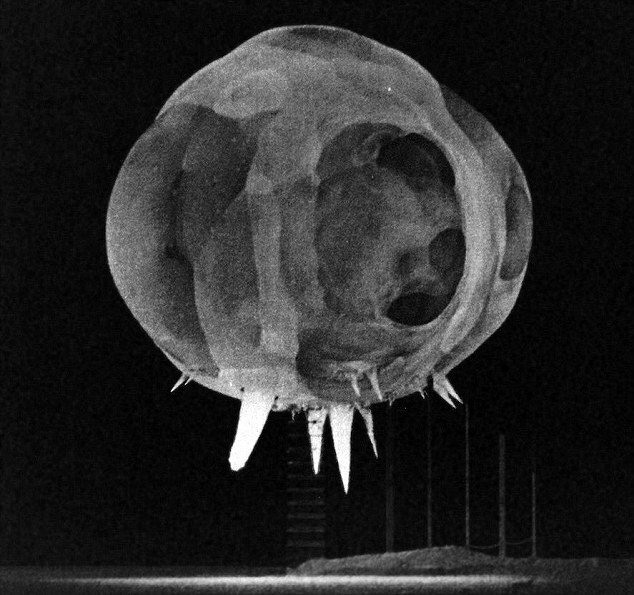 DARPA projects are often oddball technology, but it also has a history of far-sighted technological leaps. DARPA invented the first virtual reality devices, and one of the precursors of the modern internet. DARPA says: “Innovega’s iOptiks are contact lenses that enhance normal vision by allowing a wearer to view virtual and augmented reality images without the need for bulky apparatus. “Instead of oversized virtual reality helmets, digital images are projected onto tiny full-color displays that are very near the eye. 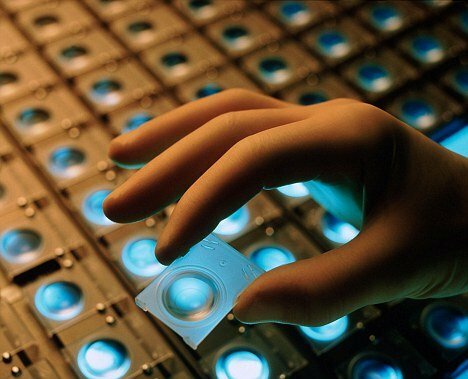 Innovega claims that the devices could become popular rapidly due to the number of contact lens wearers worldwide. The program seeks to develop novel computational imaging capabilities and explore joint design of hardware and software that give warfighters access to systems that greatly enhance their awareness, security and survivability. The team that discovered the first drug in the world for cataracts prevention won $100,000 at the Enterprize competition of the University of Queensland Business School’s in Australia. The University of Queensland Business School MBA program was ranked 46th in the world by The Economist. Enterprize competition started in 2000 and it has assisted businesses like Fusion Sport, Southern Innovation and Vaxxas (which is pioneering the Nanopatch needle-free vaccine delivery system). Dr Tim Lovell and Professor Andrew Abell and Dr Victoria Kopetz accepted the prize on October 13 after a final business pitch to the Enterprize judges at Pitch Day, held at the Brisbane Powerhouse. Professor Abell, Professor of Chemistry at Adelaide University, is the lead inventor and he has been working in the last ten years on the class of drug compounds involved. He and Dr Lovell are the co-founders of Calpain Therapeutics (Adelaide-based), which will commercialize the drug. The medicine, that slows cataracts formation and progression, targets a protein called calpain in the eye’s tissue. Calpain protein, a protease (proteolytic enzyme), can cause the cataracts clouding when it is activated by different triggers. Calpain is a protein in the eyes that can cause cataracts. The new drug investigated by Australian researchers triggers calpain and could prevent cataracts blindness. Dr Lovell has worked on drug design and development with pharmaceutical company AstraZeneca and was a business development manager at Bio Innovation SA in Adelaide. “Calpain Therapeutics is pioneering a novel drug with application to the eye health of people around the world.The proposition of the drug is to significantly slow down cataracts on their path to causing blindness. With severe cataracts the leading cause of blindness around the world, the Business School is proud to support such a visionary innovation,” said Professor Iain Watson, the University of Queensland Business School’s Academic Dean and Head. Calpain Therapeutics team was “thrilled to have won such a prestigious competition as Enterprize. The $100,000 Enterprize prize money will enable us to complete key human lens experiments, the next step before clinical trials. We will be able to start those very soon, and complete them in three to six months. Going through the Enterprize competition judging process has also been invaluable for us. It forced us to focus on and refine our business plan, to hone an engaging, informative business pitch to put to investors,” said Dr Lovell. They won the prize on World Sight Day, an annual day of awareness to focus global attention on blindness, visual impairment and rehabilitation of the visually impaired. World Sight Day is held on the second Thursday of October. It is the main advocacy event for the prevention of blindness and for Vision 2020: The Right to Sight, a global effort to prevent blindness created by WHO and the International Agency for the Prevention of Blindness. The world-first drug that could prevent vision loss from cataracts has been effective in preliminary trials but is yet to be tested on humans. This medicine could delay cataracts progression in such a manner that surgery might never be needed, said Abell. “Optometrists can tell very early on whether you have signs of cataracts, well before they affect vision. By using the drug early, you could slow their development so much it would not actually develop,” Professor Abell told The Advertiser. “Through a routine eye examination, optometrists and ophthalmologists can see the early stages of a cataract forming. Once it’s detected, then you could start to use the drug to slow its progress. And because we know that if you have a cataract in one eye you will most likely get one in the other eye, you could start to apply the drug to both eyes, delaying the onset of a cataract in one while slowing the growth of the cataract that has been diagnosed,” he said. Cataracts are opacities in the eyes lens, that lead to blurred vision or cloudiness. The lens is the most important transparent structure in the eye that helps vision clarity. If the lens loses its elasticity and transparency, visual impairment appears, or even vision loss. The cataract can develop in one or in both eyes. Lens transparency is affected by cataracts and can lead to vision loss. Cataract derives from the Latin cataracta meaning waterfall and from the Greek καταράκτης (kataraktēs), down-rushing (rapidly running water turns white, mature cataracts are white too). Romans performed cataracts interventions using the sharp end of a needle for surgery and the blunt end heated to cauterize the wound. The most cataracts are age-related, senile, and usually appear after the age of 65. The cataracts can be congenital (appears in new-born) or caused by heavy smoking, heavy drinking, long-term use of steroid medication (drug-induced cataract), diabetes, eye injury (traumatic cataract), exposure to ultraviolet light. Around 18 million people are blind from cataracts (48% of world blindness), lots of them in the world’s poorer regions, the International Agency for the Prevention of Blindness estimates. Childhood cataracts are very rare, affecting about 3 in 10,000 children in the UK. Cataract has no scientifically proven prevention. Yet wearing ultraviolet-protecting sunglasses may slow the development of cataracts. An antioxidant N-acetylcarnosine has been shown in randomized controlled clinical trials to treat cataracts an it is a proposed treatment for ocular related to oxidative stress (glaucoma, retinal degeneration, corneal disorders, ocular inflammation). Lutein and zeaxanthin, Bilberry extract, showed potential benefits in rat laboratory and in clinical studies. Acetyl-carnosine eye drops are believed to reduce oxidation damage in the lens, crystallin crosslinking. Trials indicated the drops may be appropriate when the surgery cannot be performed. The statins seem to have antioxidants properties besides lowering lipids, cholesterol. A study suggested statin use in an at-risk population may be associated with a lower risk of developing nuclear cataract disease. Systematic application of azapentacene sodium polysulfonate (Quinax) slows cataracts progression showed an observation of an average five years. More than 200,000 cataracts surgeries are performed every year. The cloudy lens is replaced with a synthetic lens (an intraocular lens implant). Intraocular lenses are usually monofocal and the patient is dependent on glasses after surgery. New multifocal lenses are flexible and can be controlled using the same eye muscles used to control the natural lens, leading to a less need for glasses. Cataracts surgery lasts 30-45 minutes. The vision is improved very soon after the procedure and normal vision (with glasses) is reported in around 95% of cases. Complications after surgery are relatively uncommon. American Academy of Ophthalmology is warning about the risks associated with decorative Halloween contact lenses. The American Academy of Ophthalmology is working with its partners the American Association for Pediatric Ophthalmology and Strabismus (AAPOS), and the Contact Lens Association of Ophthalmologists (CLAO). The Academy’s EyeSmart® public education program works to educate the public about the importance of eye health and to empower them to preserve their healthy vision. The consumers have to be aware that using contact lenses without an eye examination and a prescription from a licensed eye care professional can cause severe eye disorders, infections, and even vision loss. All contact lenses are medical devices that require a prescription and proper fitting by an eye care professional (ophthalmologists, optometrists, and opticians). Even if you have a perfect vision, you still need to get an eye exam and a prescription in order to wear cosmetic contact lenses. “Most people believe that decorative lenses don’t require the same level of care or consideration as corrective contact lenses because they can be purchased over-the-counter or on the Internet. This is far from the truth. In fact, permanent eye damage can occur from using over-the-counter lenses. We want to discourage all consumers, especially teens, from buying contact lenses in beauty salons, novelty shops or in Halloween stores,” said Thomas Steinemann, MD, professor of ophthalmology, MetroHealth Medical Center and Case Western Reserve University in Cleveland. “Consumers need to know that permanent eye damage can occur from using non-prescription circle lenses. Personally, I have seen far too many serious cases in both children and adults from using decorative lenses. My most recent case was a girl who was only 12 years old,” he said. Halloween contact lenses are available in various colors and designs. Halloween contact lenses are available in varied colors and designs. Decorative lenses are soft lenses, they can complete a ghoulish or fantasy-like look. Blood-drenched vampire eyes (Twilight movie series), glow-in-the-dark lizard lenses, bright-colored contacts that show up best under a black light, sci-fi contacts (Avatar), anime contacts, Dolly Eyes, or circle lenses are cool and trendy options. The Halloween looks can include Wild Eyes (CIBA Vision), cat-eyes, zombie or glow-in-the-dark eyes, fantasy lens (Marietta Vision’s Mad Hatter style from the movie Alice in Wonderland), gothic (all-red, all-black and other scary designs) and special-effect contacts, even blind contact lenses (they are completely white and opaque). 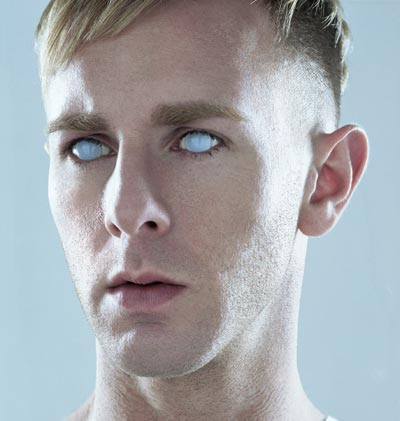 Richie Hawtin wearing blind contacts. While the price of lots of special-effect contact lenses is comparable to conventional color contacts, some gothic, crazy or FX contact lenses are hand-painted and custom made and cost more. 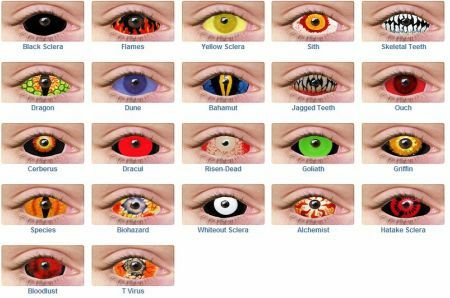 So do the scleral costume lenses, which cover the entire visible area of your eye and make you look like an insect. Check with your eye care professional to see if the costume contact lenses you are interested in are covered by your insurance plan. Circle lenses cover a bigger area of the eye than regular contact lenses. The iris appears bigger and the wearer has a doe-eyed, Anime, look. In Asia (Korea, Japan), there’s a subculture that mimics the Ulzzang look of Anime figures (cartoon). 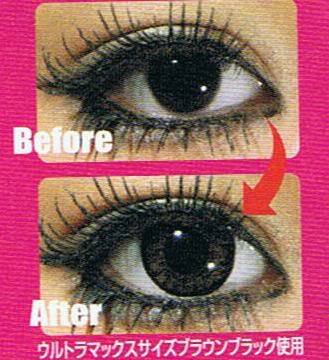 Circle lenses: before and after they were put into the eyes (Anime look). What you should know before buying decorative contact lenses? 1. The persons with following conditions cannot wear contact lenses: frequent eye infections, severe allergies, dry eye that is resistant to treatment, a very dusty work environment, or an inability to handle and care for the lenses. 2. Obtaining decorative lenses including colored contacts and novelty or costume lenses without a prescription is dangerous. Using any contacts obtained without an eye exam and prescription can lead to serious eye disorders and eye infections, even blindness. Circle lenses are not FDA-approved. 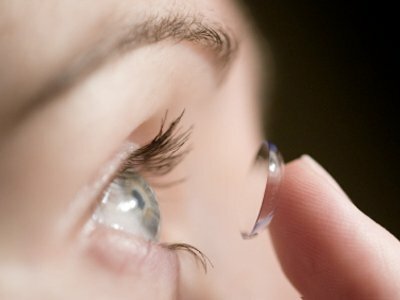 In 2005, a federal law classified all contact lenses as medical devices and restricted their distribution to licensed eye care professionals. Illegal sale of contacts can result in civil penalties of up to $11,000 per violation. Consumers should only buy decorative contact lenses from an eye care professional or a seller who asks for a prescription. 3. You need to see an eye care professional (an ophthalmologist or optometrist) to get your eyes measured in order to properly fit the contact lenses. Lenses that are not properly fitted may scratch the eye, cause blood vessels to grow into the cornea (the clear covering of the front of the eye), blur the cornea and lead to vision impairment or vision loss. Where to buy Halloween contact lenses? 1. You can buy special-effect contact lenses from the eye care practitioner who prescribes them for you; or you can ask for a copy of your prescription and buy them elsewhere. 2. Buy your decorative contact lenses from an authorized source. Look for instructions regarding how to wear and how to clean them. The package has to be sealed and sterile. 3. Do not buy decorative contact lenses at any store that doesn’t ask you for a valid contact lenses prescription. You might get unsafe products not FDA-approved, products that may have been manufactured improperly or don’t have sterile packaging. Even wearing FDA-approved lenses can be dangerous, if they do not fit to your eyes. Poor-fitting contact lenses are a discomfort, cause serious sight problems, abrasions and infections, so the prescription is needed. How to wear decorative contact lenses? 1. Wash your hands with unscented soap and warm water before you put the contact lenses into your eyes and follow the eye care professional or the product care instructions. 2. Special-effect, decorative, cosmetic, or circle lenses generally are designed for daily wear only and are not FDA-approved to be wear while you are sleeping. Wash your hands and take off your contact lenses before you go to sleep. 3. Do not borrow your friend contact lenses and do not lend yours to your friend. 4. Clean, disinfect and care for contact lenses as directed by the eye care professional. Contacts lenses that are not cleaned and disinfected properly can cause painful and severe infections, or lead to vision loss. 5. See your eye care medical doctor (ophthalmologist) for routine exams to monitor the health of your eyes. For more information about eyes health and contact lenses please visit: www.geteyesmart.org, www.aapos.org, www.clao.org.